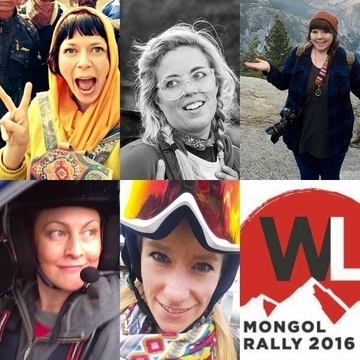 Help Team #WeLive Conquer the Mongol Rally 2016! Team #WeLive hasn't added a story. An ex-roadie punk rocker turned shamanic practitioner and aerial silks acrobat who lusts after roads less traveled. 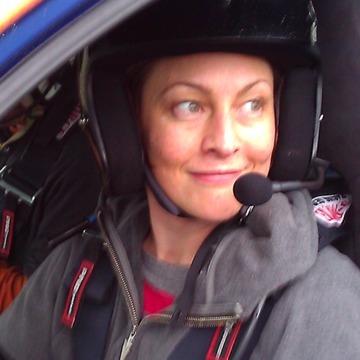 Paula also is the only one of us with mechanical skills which means our cars have a fighting chance of surviving. Currently relocating to Scotland from Seattle, Washington, USA! A ballet dancer, writer, and entrepreneur.Tabitha learned how to drive off-road in the wilds of Northern Maine in a Dodge Neon so that should come in handy. 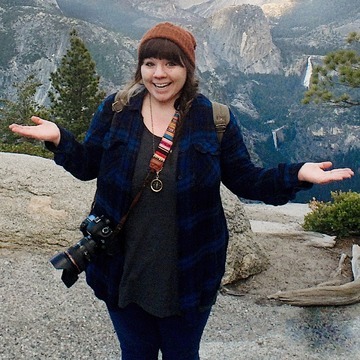 Megan is a web designer, graphic designer, videographer, and photographer. 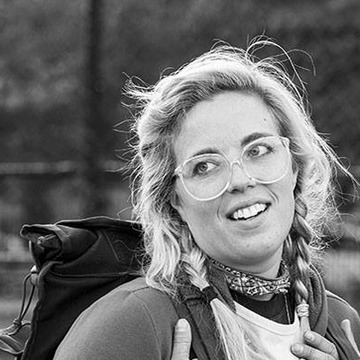 Megan is passionate about capturing a moment with her lens so that the rest of the world (some of whom don't want to go careening across 1/3 of the globe) might glimpse the realities of humanity. The Mongol Rally thunders 10,000 miles across the mountains, desert and steppe of Europe and Asia each summer. There’s no backup, no support and no set route; just you, your fellow adventurists and a tiny car you bought from a scrapyard for £11.50. The Mongol Rally is about getting lost, using your long neglected wits, raising shedloads of cash for charity and scraping into the finish line with your vehicle in tatters and a wild grin smeared across your grubby face. We are leveraging this adventure of a lifetime to reveal what women's right's organizations along our route REALLY need in support. Be part of our commitment to two charities and millions of voiceless women. Plus we are raising money to support two charities! Plus, we need two cars, petrol, food, water, supplies, and many Visas. Simply tap the "Contribute" button up in the right hand corner pick a Perk (or not) and you're done! Team #WeLive hasn't posted any updates yet. What could be more dramatic than songs from Aladdin being sung as we drive across the desert? Or more poignant than ballads from Mulan in Mongolia?! Choose your song in the comments of your contribution and Megan will karaoke the crap out of it and dedicate it's posting to you. When you choose this perk Brianna will take the time to find a post card, write you a personal note about what she is experiencing, and then send it to you from the country of your choosing along our route. It will be a glimpse into that country and our experience, and will give you a lovely conversation piece for your home. Please be sure to include your mailing address and desired country of post-mark. For $20 Alice will draw you a lovely sketch of what she saw that day on the trip. Then she will close it all up with love and send it to you from a post office somewhere between London and Ulan-Ude. Simply choose the date that you would like for her to sketch for you and add that to the comments when you contribute! Remember to leave your address! If you know Megan, you know Bo the Gnome. 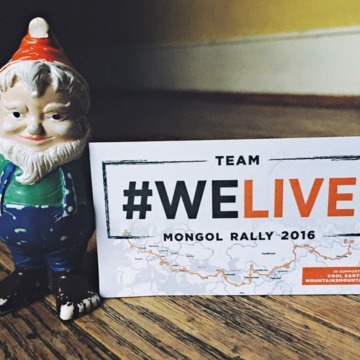 This galivanting Gnome has been all over the world with Megan and he's really excited to go on the Mongol Rally! He's SO excited that he's offering to mail you a personalized photo of him from any of the amazing places Megan will be along the Team #WeLive route! For a mere $20 you choose the local, Megan will snap a pic of Bo, and the two of them will send it to you from that country! In this Perk, Tabitha will approach a local and ask them to teach her how to say phrases in their native language. The process will be recorded and shared in your honor. Footage of Tabitha stumbling awkwardly through pronunciation is the real perk here. "Thank you for sharing your country with me." "Donald Trump is a fool." For a mere $20 Paula will perform yoga with and around the objects or locations or your choice. Specify your request in the comment when you contribute or tell her to wing it! It's up to you! Send Tabitha on a mission of your choice. You get to make up the adventure!! You're in total control of this one! - Send her to a local cafe to meet a new friend and ask them about their job. - Find the local post office and find out how much it is to ship a shoe box sized package to the US. - Find and pet a camel. - In an open air market find _____ available for purchase. YOU'RE THE BOSS! You pick! Make sure to include your option in the notes when you Contribute! When you contribute $50 Paula will execute a circus pose on top of our crappy hatchback! The process of actually this happen promises to be full of reality-show level fun and will be documented in your honor! For $50 Alice will challenge a local to a wrestling match and do her very best to take them down! Bonus: Alice's 3 months of very recent jujitsu training. Have the whole debacle filmed and dedicated to you! Megan is the proud owner of 1) a very tiny harmonica 2) a very large Star Wars obsession. When you purchase this perk Megan will perform John Williams' theme from Star Wars on her mini harmonica in an extremely unlikely and most probably embarrassing situation. The more times this perk is purchased the more hilarious locations and reactions can be recorded and uploaded for your viewing pleasure! Tabitha, being a trained ballet dancer, will choose an unlikely location and perform a ballet variation from a famous classical ballet! No pointe shoes, but FULL performance will be recorded and dedicated to you. If you have a favorite ballet variation please note it in your comments, if not Tabitha is happy to provide one from her repertoire. 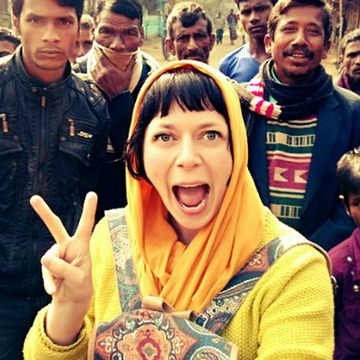 Expert travel blogger, Alice, will teach you all the secrets of how to craft the perfect blog so maybe you too can go out and experience the world and get paid to do it. Get one hour of training for $75. Disclaimer: we do not promise that you'll actually become an professional travel blogger but we do promise you'll learn helpful tools. 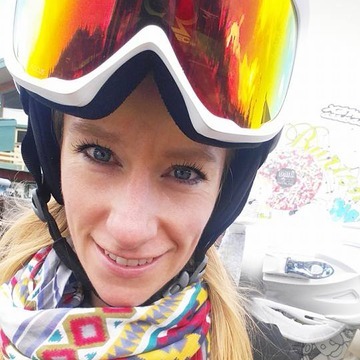 Brianna, Team Linguist, also happens to be a talented and trained designer dedicated to responsible sourcing and production. Her company, Ministry of Culture, offers a whole line of fantastic products including clothing made of hemp and other natural fibers, waxed canvas bags, and urban headwear/accessories. For $150 you get your pick of product! Simply follow the link to the Ministry of Culture Etsy to pick your product, then specify in your contribution comment. 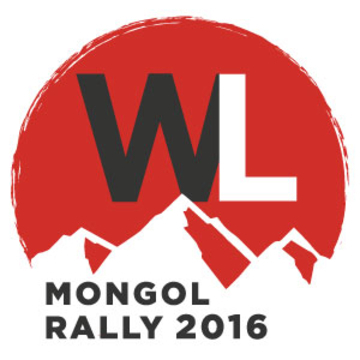 Your item will be delivered after our return from the Mongol Rally in fall of 2016. Replacing this Perk with a shenanigan of higher entertainment value! Paula Wood is managing the funds for this campaign. The campaign is for a personal cause.